When I heard about Qualia and how much praise it was getting from most of the brain enthusiasts, I decided to give it a deep look to know what the buzz was all about. I was able to gather a good deal of information on it which I am sure will be of good interest to you as far as this brain supplement goes. And in my brief but very deep Qualia mind review, I will be looking at the most essential aspects of it including what it really is, the ingredients, how it works, dosage, benefits, customer reviews and complaints, side effects, the best place to buy it online, pro’s and con’s, video review and my final thoughts about it. I believe this review will help you know the nootropic well enough to decide if it is your right fit. And if you have any questions about an aspect of it that I may not have tackled here, feel very free to ask me anything about it. I would be happy to help. Okay? How Should You Take Qualia? My Final Thoughts on Qualia – Is it Worth it? This is one of the most popular brain supplements out there. It is an advanced nootropic that is known to help with boosting focus, mental clarity, improving moods and memory and enhancing cognitive performance. It has a unique formulation of more than 20 well-known ingredients in the brain improvement industry that are highly effective in elevating various mental abilities. It was made by a well respected company called Neurohacker Collective. This is a very popular company with nootropics. It is owned by Jordan Greenhall and Daniel Schmachtenberger. They are two guys who are loved by most brain enthusiasts because of their amazing thinking abilities and intelligence. They are among the great thinkers who have shown high levels of intellect and definitely people you want to listen attentively to. Other than Qualia Mind, the company has also made other versions of Qualia like Qualia Mind Caffeine Free and Qualia Focus. Although Qualia Mind seems to be the most popular. It is actually among the top 5, if not the best, nootropics in the market at the moment. Frankly speaking, this is the first supplement I have seen with more than 20 ingredients. I have seen other with more than 10 like Alpha Brain, but never twice as that, before this one. The good thing is, they have either been used as individual nootropics or have been used as ingredients of the supplements that have proven to be effective over the years. Now that is a whole lot of ingredients! And I will be looking at each of the ingredients and its contribution to the overall benefits in the “How the Ingredients Help”section below. You may want to have a look at that section as it helps you see the health benefits you will be getting from every one of the ingredients. When it comes to Vitamin B3 (as niacin), brain fog has been frequently associated with lack of enough vitamin B3. So having this will improve on that not to mention your overall cognitive performance. Vitamin B5 (as pantothenic acid) is famous for improving heart health, reducing stress, increasing the rate of metabolism in the body, stimulation of hormones and skin and hair care. Vitamin B6 enhances the efficiency of the nervous system and prevents most brain related issues like Alzheimer’s and dementia. It also improves moods, prevents diabetes and improves the symptoms of rheumatoid arthritis. Vitamin B12 improves your moods and reduces depression, enhances and maintains good memory, increases your energy levels and improves the health of your skin, hair and nails. Vitamin C is known to give a hand with the memory and your thinking abilities as you are aging. It is also able to improve your immune system and handle the factors that increase the risks of getting heart diseases. Vitamin D3 helps with improving bone health, preventing cancer, ensuring a healthy pregnancy period and reducing the risk of getting diabetes and flu. Huperzine A enhances the memory and also helps with improving cognitive performance in patients struggling with Alzheimer’s disease. 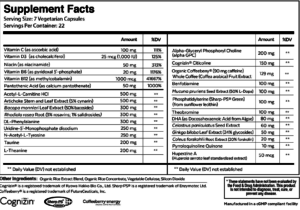 Uridine monophosphate enhances your cognition and memory. It has also been found effective in reducing inflammation and for heart health. Theobromine is known to help with improving focus, concentration and visual processing of information, reducing blood pressure and boosting mental health. When you think about improving your athletic ability and reducing muscle soreness, phosphatidylserine should come to mind. It brings down depression and improves memory as well. Rhodiola Rosea reduces stress and depression, fights fatigue and improves brain function not to mention performance in your fitness exercises. Mucuna pruriens helps with boosting focus, moods, learning abilities and reducing depression and anxiety, and symptoms of ADHD. Baacopa Moneirri improves your memory, creativity, information retention capacity, reducing frequency of the episodes of epilepsy and promoting optimal blood pressure. Artichoke extract promotes good liver health, regulates blood pressure, lowers blood sugar levels and improves the digestive system. Gingko Biloba reduces anxiety, dementia and Alzheimer’s as well as enhancing the memory. Coleus Forskohlii improves testosterone levels and slows the aging process. Acetyl-l-carnitine helps with improving the performance of the brain and in helping you have high energy levels when working out. It also increases your endurance during the workouts. DL-Phenylalanine helps you relieve pain, increase your concentration and focus and elevates your moods. N-Acetyl-L-Tyrosine is known to improve neural communication, it increases tyrosine’s bioavailability and acts as a precursor of melanin that helps in reducing neurotoxicity. Taurine boosts your heart health, helps you perform more during your workouts and may even help you fight diabetes. L-theanine is a popular ingredient that increases cognitive performance, improves the quality of your sleep, reduces high blood pressure, improves mental focus and helps you relax. Alpha GPC is popular with neuroprotection and improving cognition. It is possibly effective for enhancing your learning abilities and formation of memory. Cognizin (citicoline) is known to increase your mental energy, production of neurotransmitters like dopamine and acetylcholine and slowing the aging process of your brain cells. Organic coffee berry helps with improving your brain health, enhancing your immune system and lowering blood pressure. Benfotiamine helps with protecting people with diabetes against oxidative stress that is brought by dietary AGEs. It also helps with other diseases like Alzheimer’s and diabetic neuropathy. DHA reduces the risks of getting heart related diseases, early preterm births and also handles inflammation. When it comes to workouts, it supports recovery of muscles after a workout and can help with some eye conditions. Celastrus paniculatus seed extract is a good anti-depressant and also acts as protection of neurons from toxicity induced by glutamate. Pyrroloquinoline quinone mainly helps boost your short term memory, your metabolism of energy and reduces inflammation. After being tried out by a good number of people, there have been numerous positive reviews with Qualia. In many of the places I looked for customer feedback of the product, I saw lots of positive reviews than negative ones. And to give you a good idea of what people are saying about it, here are some personal reviews from its users. Although there were some people, very few though, who said they never got any good results with it. Many of them didn’t state the reason but others didn’t confirm with their doctors if it was right for them based on their health status. That is why I encourage you to check with your doctor first to ensure it is okay for you to use Qualia. It will increase your chances of seeing consistent results. The other good thing about it is that it has been recommended by doctors, health and fitness leaders as well as scientists so it is something you can rely on because of its credibility. The company that made it recommends having 7 capsules in the morning when you wake up, slightly before you have your breakfast (pretty much on an empty stomach). This way it will kick in much faster. If you experience any stomach issues, take the capsules together with your breakfast. Although the dosage varies with your sensitivity and body weight, you are advised not to have more than 12 capsules in a day and definitely, not more than 10 capsules all at once. Feel free to test out different dosages, but please be sure not to overdose. Also, the company advises you to take it for 5 days continuously and then take 2 days off, and repeat this cycle every-time to help you avoid building resistance. There are no reported side effects with Qualia if you stick to the recommended dosage. If you do, you are likely to experience headaches, stomach issues, muscle tightness, fatigue and disruption of your sleep patterns when you have it in your late afternoons. 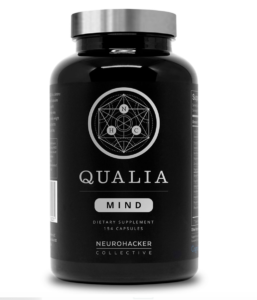 You can get your bottle of Qualia from the company’s website, which is www.neurohacker.com. Do note that buying a single bottle will be more expensive compared to subscribing. Most people have opted for the subscription option as you get a huge discount. You can also get it on www.amazon.com. I recommend buying it from there if you were planning to do more online shopping as it will help you save time and order everything all at once. If you would like to see what someone who used Qualia for a good while now has to say about it, here is a video you will want to watch. Personally, I find Qualia to be quite worthwhile. The ingredients they have used are the best known ones for brain power and they are natural. Actually, some of them were used decades ago as herbs to help with maintaining brain health, which means you are working with good stuff here. The other thing is the feedback it has gotten thus far. Although the product wasn’t launched long ago, it has gathered good popularity over the short time it has been in the market, and the reviews increase by the day. Thirdly, the fact that it is now being backed up by doctors, fitness leaders and scientists, is something that shows they are making the product the right way and it is doing a good job for most people. I like the fact that it is not exaggerated as with other nootropics I have reviewed in the past. Qualia is now competing with top nootropics in the industry, which are Alpha Brain and Mind lab pro, and I have to say it is giving them a really stiff competition. So it is worth your time and money! And that is all there is to this great brain supplement. If you have any questions or thoughts about it, please feel free to leave them below. I would love to hear from you. I will also get back to you with the answers to your questions soon after I see them. 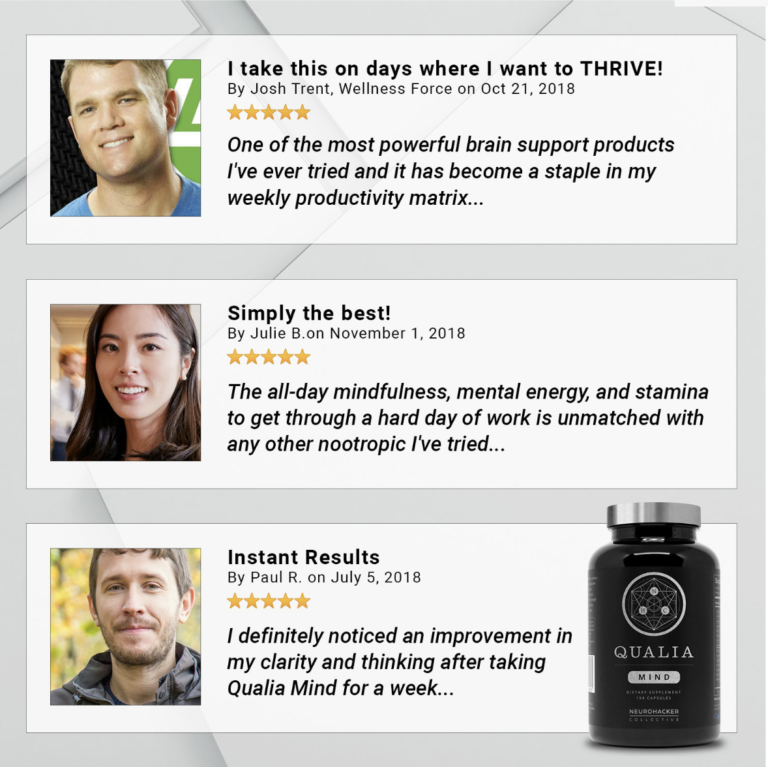 Qualia Mind is an advanced and newer version of the famous nootropic stack Qualia.Neurohacker Collective, the company behind the product, has an outstanding reputation in the nootropic industry.So when I received the supplement, I expected a lot. After I tried it out for the first time, I soon realized why it is so popular. I am very glad to hear that you found Qualia Mind effective. The guys behind it sure did a good job and it is evident by your experience and many others. You might have had a bad experience with other nootropics in the past which makes it difficult for you to trust nootropics. I have been in a similar situation but with other products. However, I think it all boils down to how are willing to find the right nootropic, as you say. As you may have seen, Qualia does a good job and I am sure you will see the same with other reviews of it. This is one really potent supplement and if you give it a go am sure you will see that too. You can also do more research on it to be completely satisfied before getting into it. I highly encourage you to do that. 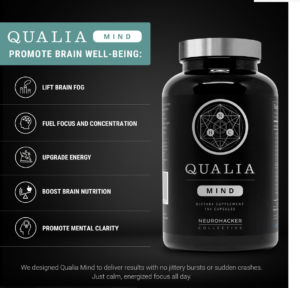 I have been trying to find a supplement for mental clarity and then i found out about this product Qualia Mind. It does sound to be an amazing supplement as it is not only good for your brain but for your health as a whole, and the boosting of your energy. My concern is that can anyone take it? I mean, is this product good for those past their prime (50+)? I have also heard about Qualia Focus. What is the difference with the Qualia Mind? We are glad you stopped by. Well, you can use Qualia Mind whether you are young or old. It does a really wonderful job either way. About the difference between Qualia Mind and Qualia Focus, I would like to give you very comprehensive information to help you understand best. So here is a post from the creators with the full explanation of the difference. Hope this answers all your questions on this topic. This is a very good review on the supplement that has piqued my interest over the last few weeks. It has helped me know all I was asking myself about it. I think I am now ready to order my bottle. Thanks a lot for taking your time to create this detailed review. We really appreciate your comment. We do our best to help people like you get the best information on brain supplements before you buy so that you are very sure what they are and what to expect. Your comment means so much to us as it shows us that we achieving our goals. We also encourage you to read more of our posts.